There is one fact that I gladly used to mention in my notes, works and conversations. The first time I ever read that fact was in a phenomenal book by David Mitchell, Cloud Atlas. The book speaks about something that one day will be clear to all of us. That is why in this abyss it is important to talk about things which can morally and spiritually raise us up, things like our heroes. I come from a small country. But not a small culture. If culture can find people like St. Sava, Ivo Andric, Nikola Tesla or Mihajlo Pupin, you can be proud of it. But I intend to speak about less known Serbian figure of hero, Miloš Crnjanski. One of the biggest writers we can find in the twentieth century is this man, born one autumn day in 1893., at a place called Čongrad in what was then the Austro-Hungarian Empire. Many Serbian families were settling in the south part of the Empire by migrations at the very end of the seventeenth century. It was convenient for the big Empire to settle these families in the borders of its land because these families serve them as military personnel. They were kind of protection from the Ottoman Empire. The father of Miloš Crnjanski, Toma Crnjanski, was the first in the familly of Crnjanskis who broke with the ‘military tradition’ and became a ‘notar of the village’. This man had the biggest role in the upbringing of Miloš, because he used to say how his father gave him a lot of information and knowledge about the history of Vojvodina (north province of today Serbia), bylaws and privileges of the nation. Miloš never lost his interest in, and love for, his nation. He felt it intensively till his last breath. ‘There was consternation among the Viennese as they saw the coffins of the Austrian prince and his wife, the countess Chotek (whom Princip had killed unintentionally, while aiming for the governor of Bosnia, general Poćorek). ‘All the station was wrapped in black. ‘And the locomitve was arrived with red eyes. ‘The coffin of the Erchercog was much bigger and with more wreaths than the coffin of his wife, who was only a countess. In Austria there was no equality either amongst the court (palace) nor among the deaths: everything is, in a coffin, measured with the Spanish ceremony of the Habsburgs. In ears, sometimes, in dreams, I can still hear the sound of Austrian generals’ footsteps from the exequies. They marched down, swinging to the rhythm of a funeral march by Chopin, with their two-pointed hats on their heads, and hats were ornamented with green feathers from the tales of roosters. The sound of horses’ thuds was heard. Such was the silence we created’ (Crnjanski 2010: 143-144). ‘It was such a carefree mood in Europe at the end of it all, at that time, that for example, the supreme commander of the Serbian troops (Duke Putnik) came for treatment at an Austrian spa resort. ‘Austria, however, prepared an ultimatum for Serbia, secretly, like a crime. When it suddenly announced the mobilization, Europe start to panic. Fathers and children, husbands and wives, began to seek each other over the phone’ (Crnjanski 2010: 146). Crnjanski was conscripted in Vienna. He was determined to serve the city’s artillery fortress of Przemysl. He was in the barracks K und K. It was a regiment of twenty-nine, Becskerek. After he fell ill with cholera, he was sent to the hospital and spared, directed to go as an Austrian corporal in Serbia. He said, ‘I do not think I would have survived it’ (Crnjanski 2010: 148). ‘In Galicia I have seen war. ‘In Vienna a breakdown of empire and a capital. ‘[…] There were two types of Vienna. One: a healthy, young type who went to the battlefield, and returned to the hospital, with no arms, legs or head. And another one: rich, toothless, reject, slacker, who remained at home with abandoned women. One went to their deaths – the best ones of the population and the others – who became rich at the expense of them – they were rolling yet in the music of a waltz’ (Crnjanski 2010: 158). Now we are carefree, light and tender. flows and is all red. like the cherries of my homeland. and the icy mountains with our tender hand. ‘It was cold. I was in a bunch of strangers passengers. The grass was wet and we slid slowly, and some were falling. When we crawled up the hill, below us in the dawn, was pointed out the Danube, gray, misty. All this fog, behind which you could see the sky was immense and endless! Green hills, like islands above the earth, disappearing as early as dawn. I was lagging behind the others. ‘And my thoughts yet followed my friend to his fine journey which he talked about to me, carefree, with a bitter humour. Blue sea and distant islands that I do not know, ruddy plants and corals, which I remembered I guess from geography just as it emerges in my mind. Finally, peace, a dawn’s peace, slowly entered me. All that my friend was talking about, and he himself, hunched, in the shabby, military overcoat, remained forever in my brain. I suddenly remembered cities and people that I saw, on my return from the war. It is the first time I noticed a huge change in the world’ (Crnjanski 2010: 197-198). Crnjanski sees these omnipresent connections as a kind of salvation and atonement for what has befallen humanity of the twentieth century. He felt that the changes that have befallen the world carry with them a deep mark that will heal when he is deported to London in 1941. As an immigrant in London, he will spend nearly twenty five years as a paperboy and shoeworker, unwilling to accept the socialism and communism milestones that have occurred in his country. Because of his explicitly anti-communist orientations, he won’t be able to stay in Serbia (then Yugoslavia). At the end of his life he will get the attention which every great man deserves, and will spend his last days with his wife in Belgrade. His literary work has great importance because he felt global changes that were still unintelligible. He made a poetic masterpiece named ‘Lament over Belgrade’. Even the translation can’t be as effective as it is in his native laguage, but I’ll share it with you. I owe it to this hero. visit me as apparitions, while here I am silent, sleepless and dying. and the blue Avala, in the distance, like a hill. melting like the Sun ice of tears and last-winter’s snow. There is no absurdity in you, no death. You shine like an old unearthed sword. repeating like the day and a child’s cry. you will, I know, hold me in your lap. still visit me as ghosts, phantoms and flames. My Sibe gone mad, agape like a dead fish. laughing at me and screaming in my solitude. over the rivers Danube and Sava, in their dream. a giggle, here, in my cry, wail, and scream. You glimmer, as human laughter, through the tears. you will, I know, kiss and touch me with the mother’s hand. in the company of masks that came to claim me. behind us on the ground or in grass. over fertile plains, like a shield, raised and hard. weaving through ages, with lightning, your own line. There is none, in you, my human sadness. Like an archer’s, your look is mute and straight. and, inhaled, cool me, like a distant pine. your acacias will fall on me like the rain. and I move the land and all into the dream, the dream, the dream. like a rock against the dark Kalemegdan. As tiny ants, to you are all our miseries. You cast down in the dust those precious pearls, your tears. Which I had gazed in my young and happy years. At last, on your soft pillow shall I rest my head. While, out of the past, I hear her footstep light. And our words «grave» and «darkness». Away from death, and blood, upon your way to light. But you arise with dawn, all shimmering and bright. That desert where the ghostly caravans pass by. So you shall give me consolation till I die. I know that you they cannot, cannot break or harm. That comes to all the actors on our stage, all, one by one. Unceasingly, through gloom, and dust, and countless tears. To cool the breath of all those whose quietus nears. And Sava, and broad Danube, flowing slowly by. The sun is rising in my dreams. Now shine! Flash! Roar! Your name rings out, like lightning from a clear blue sky. Crnjanski, Miloš (2010). Miloš Crnjanski, ed. by Milivoj Nenin. Novi Sad: Matica srpska. 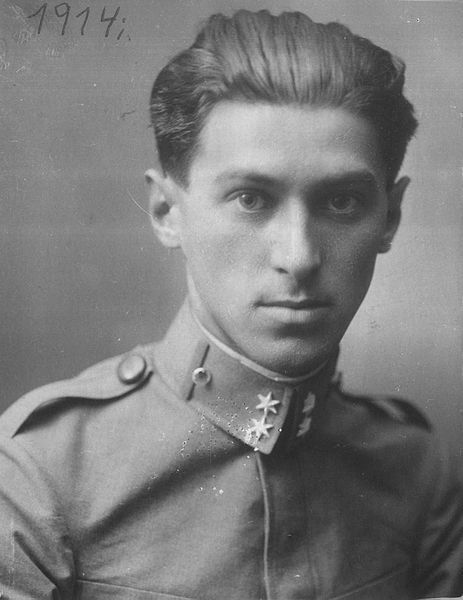 Image: Miloš Crnjanski, poet, novelist, storyteller and playwright, one of the foremost representatives of modern Serbian literary movement in the post-World War II, by Ἐπαμεινώνδας, public domain. The story about Gavrilo Princip was also one of many interesting topics in his work, but I will not elaborate on that here. In my opinion, Crnjanski here try to say that ‘everyone thinks he is worse off.’ So, the veterans in WWII forgot about the torments of previous ones. Yes, everything is connected. Thank you for this, an intense and incredibly passionate post which I found most interesting, and shall re-post upon my own blog. – sonmicloud. A fascinating article, written with passion. “Coincidences are excuses for spiritual laziness.” Thanks for the comment! Reblogged this on Vogel33 (vogel33@mail.ru).